All public transportation is available in the St. Petersburg, ranging from the tramway, metro, Trolleybus, awtobus, taxi, until marhsrutka. Sea and river transportation equip city transport options. There are many boats available for just around town or there is also a special attraction to the Peterhof Palace with the distance less than half an hour left on the dock behind the Hermitage Museum with a ticket price of around U.S. $ 17. All modes of transportation has its advantages and disadvantages. Because the city’s visitors must know the exact character of each means of transportation so they can make the most of a short visit to the efficient and effective. Do not hesitate to seek information either by reading or asking. St society. Petersburg including those who delight in giving information to strangers properly and politely. 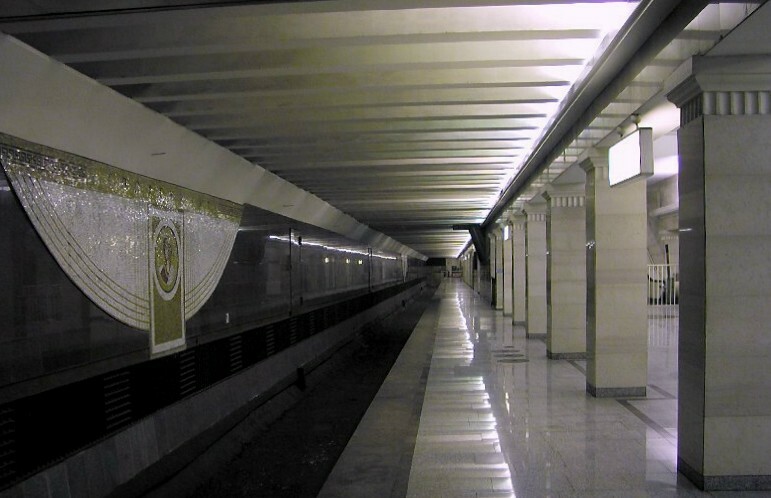 The same as in Moscow, metro in St. Petersburg is the subway. To reach the platform to wait four metro, must go into the belly of the earth with escalator which has a length of about 60 meters. Depth metro St. Petersburg exceed the depth of the Moscow metro which only has a depth of 50 meters. This mice vehicle is barrier-free transportation, fastest, and practical than other means of transportation. One of the uniqueness of the metro at St. Petersburg is available at the door in most train stations connecting door. When the train is yet to come, all the doors closed. Thus, passengers are guaranteed not to be adjacent to the railroad tracks when the crowding could harm him. 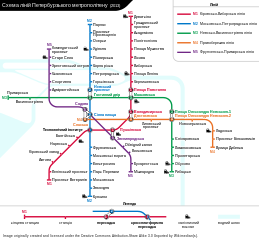 At St. Petersburg there are only five metro lines, ie Line-Kirovsko Vyborskaya, Vasiliostrovskaya – Hevsko, Petrogadskaya – Moskovsko, Primorkskaya – Fruzensko, and Pravobereznaya. To use this transport service, you should know some Cyrillic letters. Most signs or station name written in the letter. Overview quite difficult, but it can be learned easily because there are only a few letters of the Latin alphabet to read other than the usual travelers know. Each city map St. Petersburg is equipped with a metro scheme making it easier direction to be addressed. However, St. Petersburg, already many signs that have been equipped with Latin letters. Looks like the city government aggressively supporting St. Petersburg as a tourist city so as to provide information to tourists as needed. As in Moscow, using the metro is cheap but fast. Once purchased, you can go anywhere, unless it’s already out of the station. At St. Petersburg, metro tickets in the form of coins to be put into the machine in order to open the bolt. One coin worth 22 rubles or U.S. $ 0.7. Because the ticket price is cheap, it can be guessed that the metro is not very modern. Age of metro is already quite old, but still running stable. Using the metro will remind travelers in the communist heyday ornament is still plastered on almost all stations. Tramway is a train that goes over the highway with a private car and awtobus, electricity and railways. Tramway St. Petersburg has a conductor who will draw the fare from passengers. Tramway one-way fare is 18 rubles. Such Trolleybus and awtobus, tramway just stop at every stop that has been specified. Buses in Russia are known with awtobus name. While Trolleybus, bus fuel is electricity that is on the move, the bus always associate with electricity located thereon. Trolleybus or awtobus use the code number to distinguish the purpose. In front and side body awtobus and Trolleybus shown the area to be bypassed. If travelers are unsure if selecting Trolleybus number or awtobus It is true that, prior to use should be asked to the driver, if the bus was passing the place to be addressed. Trolleybus stop awtobus place and always at the stop so it is not possible rise and fall of awtobus in any place. Awtobus and trolley buses in St. Petersburg usually use conductors that serve to withdraw money from the passengers. Travelers simply enter the front door, then the conductor will be approached to request fee of 18 rubles. For simplicity, better give a small nominal money, such as 50 rubles and specify for how many people. In the Trolleybus and awtobus, always mention the name of the destination stop so that passengers would have to listen if you do not know the area. To simplify where you have to go down, when the conductor asked for the cost, say your destination and ask that he tell you when to get off. The entrance and exit Trolleybus and awtobus usually different. Most always from the front entrance and the exit is in the middle or at the back of the bus. To more easily, follow other people going in and out. The vehicle is intended to transport passengers within a short distance or connecting transport from one center to the other public transport. the distance is usually not too far though there are some marshrutka at St. Petersburg has a range of up to less than 10 km. Marshrutka in this town has a price difference from one to the other, depends on the distance traveled. The further journey, the more expensive. In addition, there is also much near the same. Usually there is a sign above the driver how much it should pay. Payments range from 20 to 60 rubles. In general, marshrutka relatively cheap transportation. Although sometimes there are passengers who have to stand up, marshrutka still comfortable to use. Official taxis in St. Petersburg always a sign that said open the door of a tax at the rate of 300 rubles and then follow the meter shown on the dashboard. Like in Moscow, in St. Petersburg is also available with a dark taxi fare as-bid. The arrival of the aircraft at the airport in Moscow usually in Pulkovo 1 St. Petersburg is located outside the city. From the airport to the city you can use the public transport which is relatively cheap and fast. In this case, travelers can directly use the K39 marshrutka often stop in front of the airport to the metro station Moskovskaya with additional cost of 26 rubles and 22 rubles if carrying luggage. Moskovskaya Metro Station, you can use the metro and reach the city center in a relatively short time and avoid congestion. Indeed, the weakness of this transport is must move from one mode of transportation to another. so quite a hassle when you carry a lot of stuff. If you do not want to be bothered, from the airport you can use these taxis into town. Once out of immigration, then you can immediately see some taxi service counters. It was dated at various prices appropriate to the purpose of the service users are generally in the range of U.S. $ 50. If forced to take a taxi, it is better to use the official taxi service based at the airport and avoid the dark cab. The fee is usually given directly to the driver at the destination by providing modest tip. Another traveler when using the train from Moscow to St. Petersburg. Station had been directly in the middle of the City of St. Petersburg so as to achieve the purpose of connecting directly can use the transport through the metro or a taxi.